OUR PRICE: $23.95 - Join Rewards Get $1 Dance Dollars On This Item! Improved fit! Slip-on jazz shoe features a soft and durable leather upper with an elastic gore side inserts, rubber split-sole patches for durability and flexibility, a cotton lining, and a heel counter for stabilization. Suggested Fitting: Same to 0.5 size larger than street. Men order 2 to 2 1/2 sizes larger. This shoe runs a little smaller than suggested. 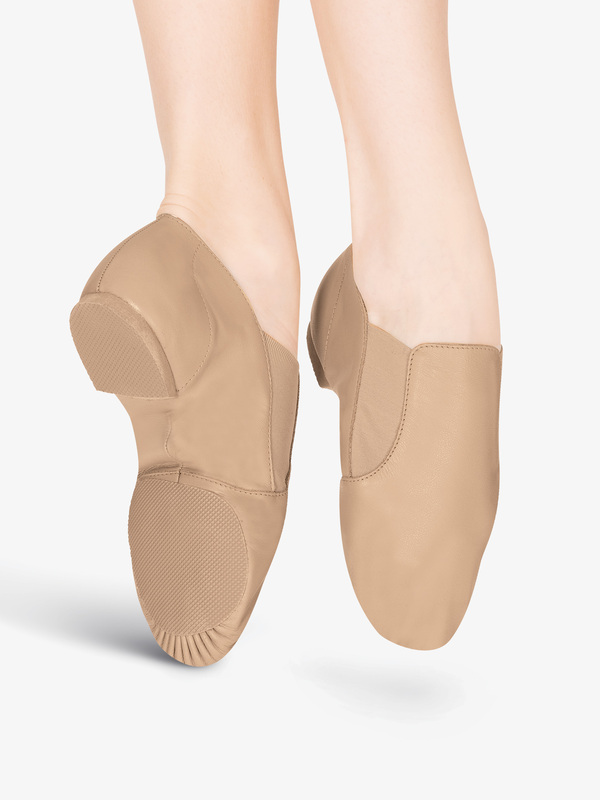 We ordered a half size up and my dancer could barely get her foot in. At least DDS makes returns easy! Our girls wear a children’s shoes sizes 3-5 and we ordered adult shoes 6-8. Runs incredibly small. Will be returning them tomorrow. Ordered my daughter her correct size and it was too small. Order a half size bigger. I followed the instructions on sizing up to women's sizes for children, and they came and fit great with a little room to grow. My daughter wears a street size 2. We got the 4.5. Hope this helps! I really love how thin these are and very comfortable, they do start peeling after a while and they run pretty small so I suggest getting a size bigger. When these shoes arrived the box was completely smashed. The shoes were not damaged but look very cheaply made and smelt like one of those big metal permanent markers. I will be returning these. Most poorly constructed dance shoe I have ever purchased. Thank you for giving us your feedback and we apologize for any inconvenience this caused. We will contact you shortly to rectify the situation. the bottom of the jazz shoe ripped, big hole on both of the shoes. Only lasted about two days of wearing them. Don't get them. These jazz shoes are very comfortable and run true to size. My only complaint is that they are very wrinkled. Does anyone have any tips for how to get the wrinkles out? I ordered these shoes for some of my students. I must say the sizes varied widely. Some were spot on and some were two sizes too small. I suspect it may have been that the parents didn't have an exact/correct shoe size for their child. Definitely get a proper foot measurement or plan for these to be too small. My daughter loved these as soon as she put them on her feet. They ran true to shoe size and she constantly says how comfy they are. I had ordered this for my Christmas Recital and I had ordered a 7.5. because that is my street shoes size. When I received it and tried it on my toes were already at the point and it was obvious that it was small. I also looked at it and it did not look fit, it was wrinkled and the sole was just not right. If you will wear this shoe occasionally it will be good enough. Size was right on par with sizing information. I found that the shoes leave black marks on some floors and some of the black wore off on my ankles. If you will be wearing these shoes several times a week I wouldn't expect them to last. But for the price you can't beat it if you will be wearing them once in a while. these shoes run very small. We needed black jazz shoes so I ordered the same size as the tan shoes she already had. These were a full inch shorter! No way she could wear them. Also, the construction and material looked really cheap. Spend a little more and buy the better shoes. I cannot recommend these at all. bought this for my 10 yr old. she is a size 2 in street shoes, but I followed the instructions on how to convert her size to adult size of this shoes. And it just fits perfectly to her. These shoes are cheaply made and do not even feel like leather. The shoe is very wide for the average foot and WILL cause foot cramps. The only positive was this shoe lasted about 7 months ( practice 5 days a week for 2 hours each practice). 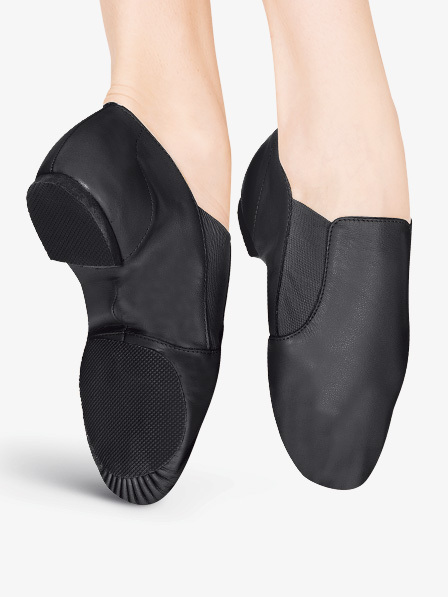 I would only recommend this to people with extremely wide feet or a person that doesn't mind being uncomfortable at dance class. Save your money and buy brand name jazz shoes. Good quality jazz shoes for the price. Comfortable and look nice. I got a half size larger than my street shoes. I ordered these for a show in the beginning of January. I am a dancer as well as a Dance teacher... I probably had worn these maybe 4/5 times a week and I got a HUGE hole in my left shoe. Right where the ball padding comes together (near the big toe) the fabric came apart and completely unravelled and tore apart. I didn't even have the shoes for three weeks and my two toes stick out of the shoe. Good price if you don't dance too often, but just going to go back to the Block brand. Don't waste your money. I know these are supposed to be a full coverage shoe, but they come all the way up the front of the ankle and buckle. Not a flattering line for dancers! Shoe is a great fit especially on a medium to wide foot. If you require a narrow shoe I recommend the Theatricals Adult Lace Up Jazz Shoe. had to return for a larger size- still waiting to see if the new size fits. Otherwise my daughter loves the fit (fits better in heel than Capezio). It is so difficult to get the correct size on these jazz shoes. My daughter had a size 4 in the same brand. They were too small for her, so I ordered a size 5. They were too tight, and they seem to fit the exact same as the size 4 pair. can you convert these measurements into the closet size please? Thanks. Adult sizes mean women's or men's sizes??? For the gore insert jazz boot by theatricals, they only list adult sizes. my question is whether these are adult women's or adult men's sizes? This shoe is sized for a womens foot. However, they are a unisex shoe and can easily be converted for a mens foot by increasing the shoe size by two. Example: Mens Size 8 = Womens Size 10 (Approximately) Please be aware this sizing is not a guarantee, just a suggestion.